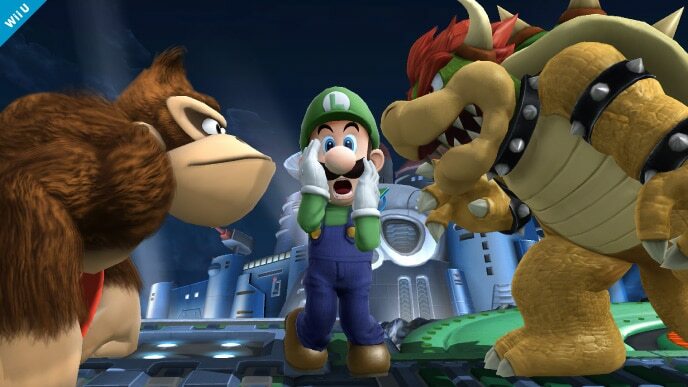 Luigi is a tricky opponent, to say the least. His jab is one of the most efficient available thanks to its perfect blend of speed and power. 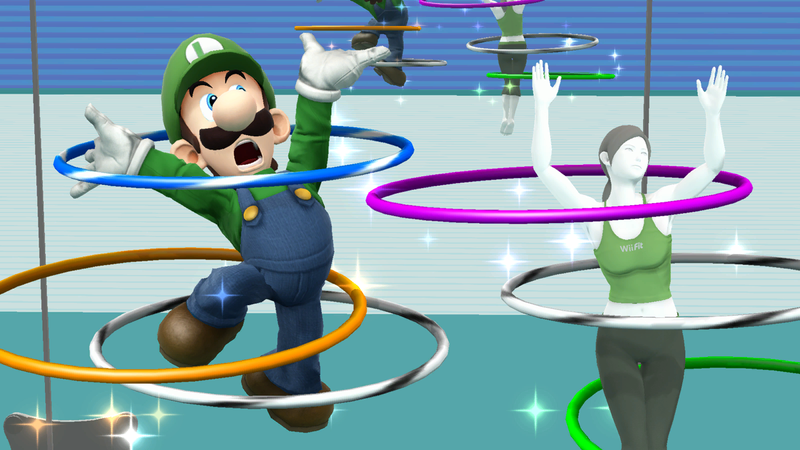 The rest of Luigi’s moveset retains that perfect blend, giving him many viable options. 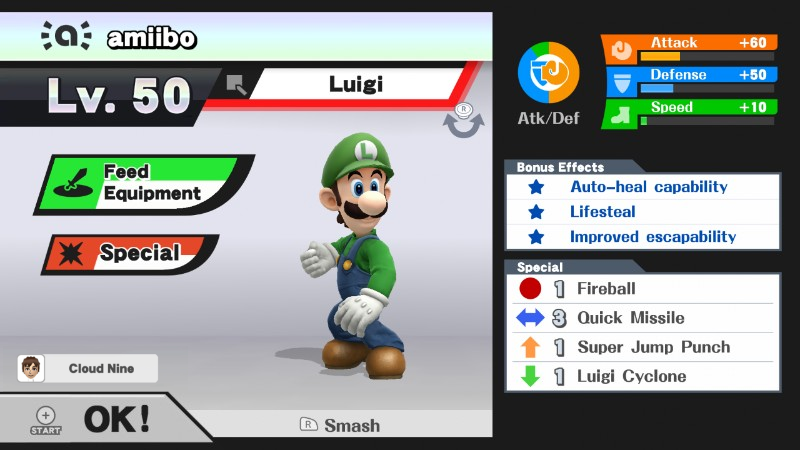 Luigi’s special moves, in particular, tend to come in handy: Fireball can harass opponents from afar, Green Missile and Luigi Cyclone can be used for recovery, and Super Jump Punch serves as a powerful KO move. 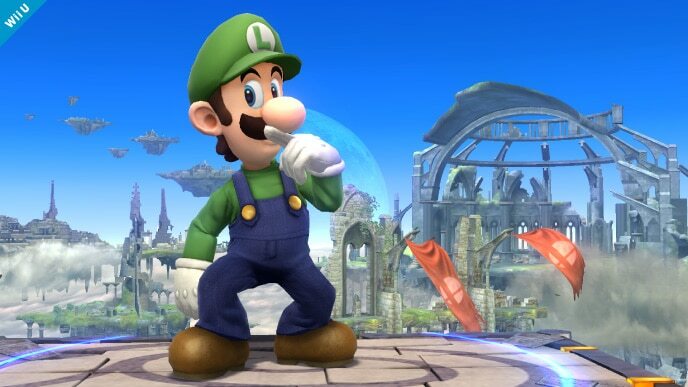 Luigi’s recovery is decent, and certainly surpasses his brother’s – this means that he usually has no problem returning to the stage when knocked away. Unfortunately, Luigi suffers from several flaws. Although his smash attacks are both strong and swift, they lack the range necessary to be fully reliable counterattacks. Luigi’s AI also overuses its aerials: in such a defensive metagame, this makes the character an easy target for grounded opponents. Furthermore, Luigi has an annoying habit of spamming Green Missile and Luigi Cyclone. These moves should be used for recovery purposes only, as attacking with them is inefficient. Finally, Luigi always attempts to edgeguard enemies with down taunt. This might sound hype on paper, but in practice, it rarely connects. Luigi does require a good bit of effort to train properly, but he has a lot of potential in store for those patient enough to work around his flaws. With the right stats, bonuses, and training methods, Luigi can contend with and even outmatch the titans of the amiibo metagame: namely Bowser, Ganondorf, and Lucina. Quick Missile: This is a custom move version of Luigi’s side special. It charges up quickly and flies faster and farther, making it a superior recovery option. Its attack power is weaker, but Luigi shouldn’t be attacking with it anyway. Neutral options: jab. As silly as it might sound, Luigi’s jab is absolutely fantastic. Simply put, if your amiibo is not within KO percentage, attack it with jab and nothing else. Main KO moves: forward smash and up smash. Once your amiibo has taken major damage, go in for the kill with a forward smash. It does lack range, but it’s worth the risk thanks to the attack’s above-average power and speed. Up smash is best used as an aerial punish. Moves to avoid: side special and down special. Green Missile and Luigi Cyclone are best used for recovery purposes only. As attacks, they don’t inflict much damage and leave Luigi vulnerable. Your amiibo will get in the habit of spamming these moves if you use them too often, so be careful. Situational moves: Super Jump Punch. Forward smash and up smash are Luigi’s most reliable kill moves, but Super Jump Punch can be used sparingly as well. Be sure to confirm your timing and spacing so that the move connects. Utilize back throw as a secondary KO move. Luigi’s back throw isn’t quite as strong as Mario’s, but its speed and power make it an easy kill option. It’s most effective at the edge of the stage. Thanks to Arklaine for compiling Luigi’s information. Images are courtesy of SmashWiki and the official Super Smash Bros. website.